The APWA-MN Fall Conference after-hours bowling event was again a big success this year, attracting a record crowd. The Membership Committee’s count was 90 bowlers, which included four U of M Student Chapter members and more than 40 additional hecklers. The winning team, with a single game total team score of 799, was Chad Isakson and Ryan Stempski of FOCUS Engineering; Mike Warner, Bolton & Menk; Emily Lueth-SRF; and Brian Bourassa, WSB. 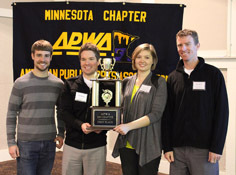 Their names will be engraved on the APWA-MN Bowling Traveling Trophy. In addition to the fun and excitement, APWA-MN President Lee Gustafson challenged all participants to donate $1 for every strike that they threw in the two games bowled for Toys for Tots. If they had more than four strikes, they could designate somebody else to donate. In total, the chapter raised more than $950, with all proceeds to be presented as a donation to Toys for Tots. Thanks to the Membership Committee for all of their work setting up this great event, and to all who participated!